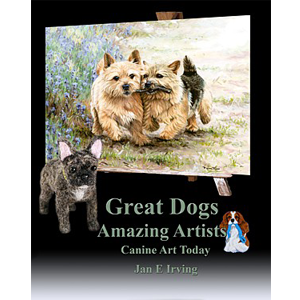 A collection of dog art from the early twentieth-first century, representing many artists from across the globe and a great variety of breeds and activities. A diverse range of media i s also represented from beads to bronze. The artworks are produced in a large full colour format, and there is also an artist contact directory. The text looks at what a happy and healthy dog is and how you can recognize it. This all came about within the twelve months as I had returned to the palette myself and had spent lots of time (and money) looking at animal artists. Some of the better known wildlife and horse artists had been celebrated in books, both genre have had good magazine support – but what of the dog? Yes, there is the Canine Art Guild (CAG) and another similar group, but what about books? With my experience in magazine and book publishing, and the printing technologies now available there was no real reason to overlook the dog artist. So through the CAG I broached the subject and did a bit of market research and found good interest and support. I basically had two options, take on the cost of production myself or ask the artists to pay for submissions to be included. Can’t say I warmed to the second option and many felt that threw the project into the realm of vanity publishing – which just has such a bad reputation it made it easy to under take the costs myself. I had put off for sometime the upgrade from Corel Ventura to Adobe Indesign but undertook that at no small expense, and at the same time converted from Corel Photopaint to Adobe Photoshop – the transition wasn’t too too bad, but it had moments of challenges. So, after the surveys, I had some leads to lovely artworks, and some idea of a reasonable cover price – price would limit the size of the book. In any case, if this title sells well, follow up volumes can be released. Overall I wanted this title to be very affordable so it had good circulation. To achieve a decent size and keep the price down meant I had to squeeze down any mark up too. But a reduced mark up didn’t concern me, the only aim, as so many had contributed freely, to this title was to cover the investment of the software, my time has been included free as offset against experience and training. So I did some calculations and investigated the print on demand facility offered for selling through Amazon and got off to a reasonable start. I had already re-published my own dog fairy tale there and had had some nice sales. Having relinquished my collectibles business as being too demanding for the returns it was producing I have been looking at making up on the lack of income, and I would like to get back to writing books, not just getting the magazines together. I re-released the 100th issue of Clumbers through Amazon, no great sales but it gave me confidence in their systems, so the series of dog care and breeding books I have planned will also be offered on this forum. But what a delightful interlude, and experience, it would be to get a dog art book done as well, so the project got underway. Naturally I already knew of some great artworks, but I wasn’t sure how artists would react – I wasn’t offering them payment, nor even a free copy of the book. Anyway, I continued to note down any lovely art pieces, even chased up artists who had feature in horse and wildlife magazines in case their repertoire included dogs and then trawled the internet on several occasions. I built a database, and sent off a form letter – I felt crouched in conservative terms and spelling out the lack of direct cash return to the artist. I have to say, I got a few hot and fiery emails straight back about being someone who was planning to bleed poor and overworked artists of their last cents, and how could I dare to behave in such a way – fortunately the later responses were more generous and supportive. I structured the project so an artist was invited to submit any number of artworks – free of charge – and from these nominations I would choose the items I actually wanted to invite. Then the artist could supply the printable electronic image. This is when things started to slide back in the time frame – some artists just aren’t good with time frames and missed deadlines, others had such poor or less then useful electronic copies, all extra things to handle at this end. At each stage I was careful to point out there was no remuneration available to the artist, and while I had not promised it, I had also allowed for each artist to have a proof of their pieces before publication. This latter part was fulfilled, but I have to say I was sorry not to be able to give artists a little bit longer to get back to me, most did it in the time frame with no hassles, one or two actually only got back to me while my own proof copy was in transit! I tried to make this invitation and acceptance procedure as easy as possible – artists are busy folk – and I have in the back of my mind a dog biography project (have had for years! ), so I developed an online database for the project. Not everything fell into place quite as easily as it was supposed to, and I had to hone scripting skills, but generally I ended up with a fairly usable system that will be tweaked and improved for any later projects. It made getting the preview online really easy, and also the compilation of the Artist Directory and indexing of the images fairly simple once I had figured the ‘code’ required for InDesign. It took a lot of mind stretching, but it is a system that will have grand uses later – although I have to remember to swap the dimensions around – they get swapped for the book captions by the system (well my poor scripting) at this stage! Selecting the art work was one of the most exciting parts of this project – and I had two dibs at this pleasure – first the choice of who to invite, and then to revel in the superb artworks nominated! Most artists easily recognized which pieces I was inviting, but two did managed to send items I hadn’t chosen to invite! And I notice one or two changed names of artworks from nomination to invitation time – which shows the fluid nature of artworks and how new some pieces were! I relied on my decent eye for good conformation and health for the subject, my artistic eye for technique and composition. I have to confess realism is very important to me, but the book could not be limited to my whims, it must represent as many breeds as practical and as many techniques as possible. So I was able to chase up some polymer clay pieces, and I did invited three photographers to contribute, none of who replied; otherwise we have just about every major medium represented, except perhaps glass! I have found many artists with astounding diligence but completely unaware of conformation, these fail to gain my interest. I was reading an article by a fabulous wildlife artist who said the fur is what gives the animal its form – actually it is the skeleton, muscle, skin and fur, and how the animal is positioned that gives it its form/shape. To create an illusion of an animal by considering fur alone gives, in most cases, the wet blanket representation or the look of a slightly deflated blow-up toy that represented at least a slightly deformed animal in the first place. Abstract and similar genre do not generally appeal to me, but those who are true to the structure and vitality of the animal subject and work in this field are truly splendid artists. I know many cannot understand a need to replicate in photographic form a scene or animal, and while I don’t have the skill or patience to do so myself, I have to marvel at the ability of a good number of artists who can! I have to say I toyed and cherished the idea of a catalogue style book with great artworks, the facts about the artworks, and no comments from me, but this is a book. While I do read a lot, I don’t often read into a book rich with pictures – in fact I did so recently and was mightily disappointed with the accompanying fluff written about some beautiful dog paintings. So, I pondered on the type of comment to include, I am no art critique nor do I have any real knowledge of art techniques and genre, I haven’t time to study this discipline. Dogs are what the artists have celebrated and I wanted the book to celebrated the dog art of today – so what to say! In the field and realm of art books, having recently read many!, one discipline is often overlooked by artist written books – composition but that would mean the book then became targeted at a smaller population and the artworks could easily be overlooked by the dog lover. So I have broached the concept of happy and healthy dogs. Musing on the idea, it came to me, that unfortunately today so many people have not had day to day contact with animals in their earlier lives but still yearned that human-non-human animal interaction. 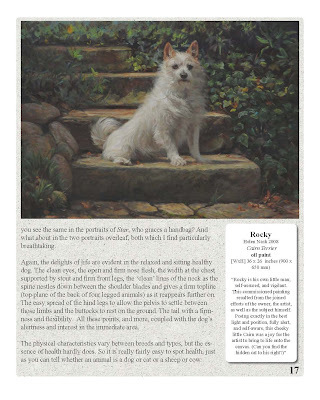 Their one curb is often not being sure they know how to recognize a happy and healthy dog – the artworks I chose represent this, so that is the line of the light text. To ensure artists can be found, as many have artworks or reproductions for sale or are very willing to undertake commissions, there is an Artists Directory at the end of the book, and available online (which artists can keep up to date). Then the final stages came around, it was a very busy spring here, three litters in the one week and not a simple whelping amongst them! Lambs and kids, shearing, titling the dog I had leased from overseas, and then a few requests or comments from a couple of artists about the text or layout. These artists have thanked me profusely for taking their comments on board and doing the minor alterations, and while it put publication back almost two weeks I still felt I owed all artists all my attention because they were committing so much to the project and trusting me to represent their artworks – yet the vast majority of them had never dealt with or known me before this book. The original publication date was to have been August, but I was very happy to let the date slip to September as I saw the Dog Writers Association of America’s annual competition ran 1 September to 31 August which would have been difficult to fit in with delivery of copies etc. Also, I saw no point in steam rolling any comments or suggestions from the artists – they are artists and have a good natural eye for composition and many are really very savvy promoters of projects – so while I found one or two points taxing I still persevered and I believe we achieved a better product for the work. This type of book can be easily replicated further down the track, and if sales are steady, I will be happy to do that. I am also toying with the idea of approaching some of the established professional artists about doing a similar volume on their own artworks, and would welcome anyone in that situation contacts me about the idea. I haven’t finalized how we could sort out royalties on such, but something will spring to mind. I will get one or two of my dog care titles done in the meantime – it will give me more publishing miles under my belt. This has been a fabulous project, a little tiring at times, but I just love the artworks I have been able to feature.